A road marathon held for more than 15 years has been reclassified as a "multi-terrain" event because the course has so many potholes. A stretch of the Cape Wrath Challenge Marathon is held on single track road near Durness, on the north Sutherland coast in the Scottish Highlands. 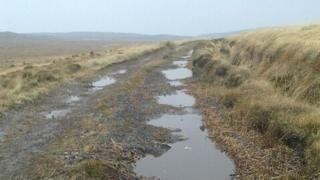 Scottish Athletics has asked organisers to describe it as an off-road event due to the state of the road. Organisers have alerted runners to the change ahead of this year's marathon. The popular race forms part of a festival of running taking place from 12-18 May, and is already full. The stretch of single track public road provides access to Cape Wrath Lighthouse. Maintenance of the road involves an agreement between Highland Council, a local bus operator and the Ministry of Defence (MoD), which owns land at Cape Wrath. Durness Active Health, the charity which organises the challenge, said: "Runners who have competed on the course will be aware of how poor the road surface is and Scottish Athletics have now advised us that the Cape Wrath Challenge Marathon course no longer qualifies as a marathon course due to its 'rough and broken running surface'. "IAAF requirements are for races to be held on sealed road surfaces." The charity went on: "Whilst we know that this may not be an issue for the majority of runners, we felt it important to highlight this as soon as possible in case entrants were relying upon their completion of the race to qualify them for entry to other marathons later in the season." It said its 10km and half marathon were unaffected by the change. The charity added: "We apologise if you have entered the marathon and this is an important issue for you." Scottish Athletics said: "The race has now been given a permit as a 'multi-terrain marathon' as it did not quite meet the requirements set by the IAAF as a 'road marathon'. "We've been working with the organisers and all the events they want to stage are happening." Highland Council said the single track was among 4,000 miles (6,437km) of road across its area that it was responsible for. A spokeswoman said: "Agreement was reached a few years back with the local bus operator and the MoD that if the council supplied materials that the bus operator would transport materials to Cape Wrath and the MoD would carry out repairs. "Materials have been supplied by the council as requested."